Adventures in Odyssey is exciting, character-building audio entertainment for the whole family&-brought to life by an award-winning team that uses storytelling to teach lasting truths. So grab your imagination and find out why over 20 million Adventures in Odyssey products have been distributed worldwide. Jason Whittaker discovers a life-threatening plot in the works after he tracks the villainous Mr. Grote to London. In Odyssey, rumors fly when a wedding brochure is mistaken for an announcement and everyone thinks Connie is getting married. Eugene and Katrina hear unsettling news about their future. And Kids&' Radio tells the exciting story about how a back-country man with a simple desire for peace winds up on the front lines of World War I. Amidst all of the conflict and comedy, our pals in Odyssey learn that being in over their heads can be a very touching and funny experience when God is put in the center of it all. - Publisher Adventures in Odyssey is exciting, character-building audio entertainment for the whole family--brought to life by an award-winning team that uses storytelling to teach lasting truths. So grab your imagination and find out why over 20 million Adventures in Odyssey products have been distributed worldwide.Jason Whittaker discovers a life-threatening plot in the works after he tracks the villainous Mr. Grote to London. In Odyssey, rumors fly when a wedding brochure is mistaken for an announcement and everyone thinks Connie is getting married. Eugene and Katrina hear unsettling news about their future. And Kids' Radio tells the exciting story about how a back-country man with a simple desire for peace winds up on the front lines of World War I. Amidst all of the conflict and comedy, our pals in Odyssey learn that being in over their heads can be a very touching and funny experience when God is put in the center of it all. 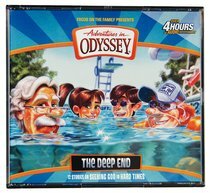 About "The Deep End (4 CDS) (#55 in Adventures In Odyssey Audio Series)"
Adventures in Odyssey is exciting, character-building audio entertainment for the whole family--brought to life by an award-winning team that uses storytelling to teach lasting truths. So grab your imagination and find out why over 20 million Adventures in Odyssey products have been distributed worldwide.Jason Whittaker discovers a life-threatening plot in the works after he tracks the villainous Mr. Grote to London. In Odyssey, rumors fly when a wedding brochure is mistaken for an announcement and everyone thinks Connie is getting married. Eugene and Katrina hear unsettling news about their future. And Kids' Radio tells the exciting story about how a back-country man with a simple desire for peace winds up on the front lines of World War I. Amidst all of the conflict and comedy, our pals in Odyssey learn that being in over their heads can be a very touching and funny experience when God is put in the center of it all. Customer Reviews For "The Deep End (4 CDS) (#55 in Adventures In Odyssey Audio Series)"
Our family absolutely love Odyssey! Our kids are entertained for hours by the great stories contained on these CDs. They are very professionally acted and are engaging on many levels. Odyssey stories always contain a great moral lesson without losing any entertainment value. I find they make great gifts for birthdays and our kids listen to them many times. Well worth the investment, as they point to God and challenge kids to pick the higher path even when life gets tough.